Does the 3-way switch confuse you? Of all the questions that come into our website, the three way switch is by far and away the most common problem experienced by the DIYer. 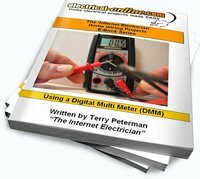 In this informative video, Terry Peterman, the Internet Electrician, provides a visual explanation of the 3 way switch. Still confused? We have many articles on the topic of 3-way switches. For step-by-step instructions on how to wire a 3-way switch, check out this article. If you are looking for a wiring diagram of a 3-way switch, it can be found here. I have also developed wiring diagrams covering the different variations for 3-way switch wiring. Want to know the difference between a standard single pole switch and a 3-way switch? I explain it in this video. The above video is a short, but informative video clip from a national television show that I appeared in several years ago. I served as the electrical expert, answered live calls from people across the country, and provided educational tips and home electrical wiring advice targeted towards the DIY audience. This entry was posted in Videos, Wiring-Videos and tagged 3-way switch, switch, three way switch. Bookmark the permalink.